PaintStop is a sketching and painting plugin for ZBrush. The PaintStop brushes are designed to feel as natural as possible, and the interface to be simple and intuitive, speeding your workflow and unlocking your creativity. With PaintStop you can quickly sketch concepts for a new sculpt, work on illustrations for print or web, or simply have fun painting. PaintStop is included with the default installation of ZBrush. To install PaintStop, run the full ZBrush installer again. See the PDF included in the Documentation folder for more details. With a model in Edit mode, a flat snapshot of your model is loaded into PaintStop as a tracing image and the PaintStop canvas has no grain. With no model in Edit mode, PaintStop launches without a tracing image selected and the canvas has a ‘Medium Cotton Duck’ grain. Many of PaintStop’s features are available in pop up menus. As you can see in the above Pencil Menu to close a menu without making a selection, press the spacebar, hit ENTER on the keyboard, or click the ‘X’ close button. 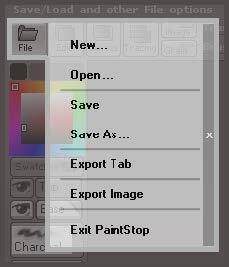 PaintStop’s brushes are arranged on the left of the interface. On launching PaintStop the Pencil will be selected, as indicated by the orange bar on the right of the button. Click to the right of the arrow to select a different Pencil. The selected Pencil will be indicated by a slight fade on image of selected pencil. Below each brush you will find the ‘X’ button that will exit a menu if there is no wish to change selected Pencil. The brushes are controlled by sliders at the top of the interface. 1. Draw Size (hotkey ‘S’) changes the width of brush strokes. 2. Color Depth (hotkey ‘D’) affects the strength of color (or effect for erasers/blend brushes). 3. The Brush Adjust slider has a different effect for each brush type. Such as chang­ing the direction of your brush stroke. Note: The top notebar above these sliders will also give a short description when scrolling over each slider. When changing the Brush Adjust slider the effect for the selected brush will be given. Color can be chosen from the picker, or thru the Swatches button. You can load RGB or grayscale Photoshop swatches (.aco files). Press the hotkey ‘K’ to bring up a swatch at the cursor position. To pick a color from the canvas use the hotkey ‘B’. This will also pick color from the other layer or tracing image. To exit PaintStop and return to ZBrush, press the Exit button on the right of the inter­face or choose Exit PaintStop from the File menu. 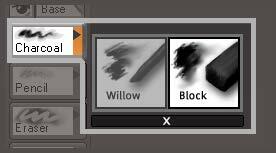 The Brush Adjust slider affects how charcoal reacts to the canvas grain. 1. Pencil has five options for different pencil hardness. (4H, 2H, HB, 2B, or 4B. )The Brush Adjust slider affects the shape of the pencil tip – only noticeable at larger sizes. 2. The sixth Pencil option is for dotted lines – the brush Adjust slider affects the dot spacing. 1. Standard eraser for which the Brush Adjust affects the edge sharpness. 2. A Gouge which cuts thru a paint layer to the canvas grain. 3. A Scraper which scrapes away paint. Note: The Gouge and Scraper take a few moments to initialize and when switching back to other brushes. The Brush Adjust slider rotates the Scraper blade by 90 degrees for any setting above zero. The slider will return to 0. The Adjust slider has no effect for the Gouge. Each reacting with the canvas grain in a different way. The Brush Adjust slider softens or hardens the effect. The markers are useful for building up smooth color in concept sketches. The felt tips produce a rougher result. The Brush Adjust affects edge sharpness (though this is subtle). The Brush Adjust only affects the Splatter where it changes the dots dispersal. The ‘R’ icon indicates that the Brush Adjust slider changes the nib rotation; for the Drawing pen the slider changes the nib shape. Press the Ribbon Texture thumbnail to add a different texture to the Rainbow Ribbon. The Brush Adjust slider softens the stroke, as if the paper is damp. For the Water Drops brush the Brush Adjust slider also changes the drops dispersal. The oil brushes add depth to the canvas in a realistic manner. The Brush Adjust slider acts like a thinner, reducing the impasto effect. Oil Blend will apply color and blend color, the degree depending on the Color Depth setting. Base Paint is useful for painting with no build up of paint. 1. Smudge will smudge color, the Brush Adjust softening the effect; use lower Color Depth values for subtle blending. 2. Palette Knife will smear paint. The direction can be changed with the Brush Adjust slider. The Brush Adjust slider will changes the rotation through a total of 180 degrees (the change happens at 10, 20, 30 and so on.) The palette knife also adds some of the selected color at higher Color Depth settings. 3. Color Blend will blend colors softly together. 5. Dodge/Burn brush works with color, shifting towards the selecting color, or its complementary with Alt held. 6. Saturate/Desaturate brush will desaturate with Alt held turning everything to gray. The Alt icon indicates that holding the Alt key reverses the effect of the brush. 7. Clone brush will copy parts of a painting: first hold CTRL and click on the part to copy. 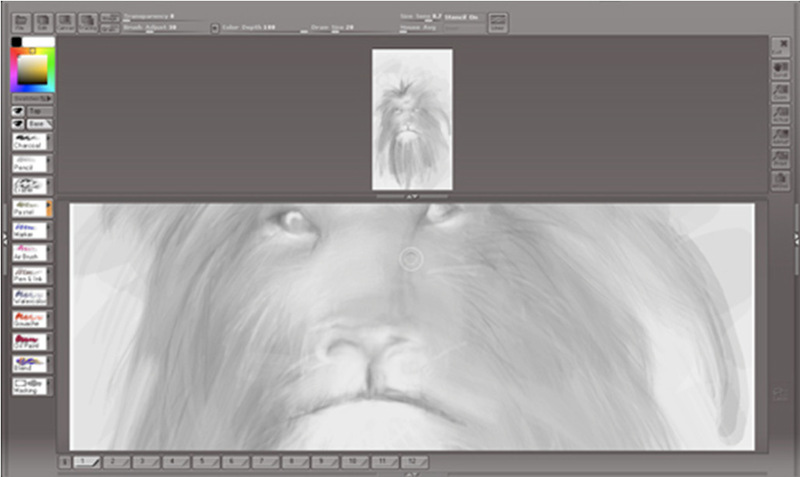 To copy from a different layer or a tracing image, set the Brush Adjust slider to above 50. 1. Enter Mask Paint Mode. This must be clicked before any masking can be done to your image. You will notice when in masking mode all other brushes become unavail­able. Once complete with the mask click ‘Exit Mask Mode’ to return to painting. 2. Round Tip is painting the mask with a round stroke. 3. Square Tip is painting the mask with a square stroke. 4. Save Stencil will save out the painted mask. You must exit mask mode before you can save the mask. 5. Load Stencil will allow a saved file as a stencil. You must exit mask mode in order to load a file. 6. Layer to Stencil will convert the selected layer into a stencil. You must exit mask mode to create the mask from a layer. When you exit masking mode your mask can be controlled by the Stencil and Inverse buttons on the top of the Interface. When Stencil On is orange that indicates that there is a mask being applied to the image. Invr will become active only when Stencil On is orange. Invr will inverse your mask. This will switch the white values with black and the black values with white. You can also move, scale, and rotate your mask by clicking the spacebar to bring up the Coin Icon. As you see in the image below. 1. Transparency will control the transparency of your Tracing Image and your lay­ers. 2. Brush Adjustment will control varies features of the brushes including angle, clone mode, softening, etc. 3. Color Depth will affect the amount of stroke that is being applied to the image. Select a canvas type to really see the effects. 4. Draw Size will adjust your draw size. 5. Size Sense: Adjust this slider to change the way stroke width varies with pen pres­sure when using a graphics tablet. 6. Mouse Average: If the settings are low that will give faster drawing, higher set­tings give smoother lines. 7. If Lines Button is switched on, straight brush strokes can be made with any brush. Note: The Brush Adjust slider can be reset to its default by pressing the ‘R’ button. All the sliders and settings can be reset for the selected brush with the hotkey SHIFT + R.
Along the bottom of the interface are twelve tabs. These are like pages in a sketch book. If you move back and forth between ZBrush and PaintStop then a new tab is se­lected each time. Previous paintings will still be there on the earlier tabs for the current ZBrush session. When all 12 tabs are used they will be overwritten. You can save all the tabs together by saving a PaintStop document thru the File menu. This can lead to big files for larger canvas sizes. You can also export a single tab for opening separately in ZBrush. Note: To see thumbnails of the used tabs press the ‘i’ button or press the hotkey ‘J’. New: creates a new PaintStop document. Note that existing tabs are cleared. You can select the size and canvas grain and specify a dpi (pixels per inch). Dpi is for display inside PaintStop and is not specified in exported images (although the pixel dimensions will be correct). Open: open a previously saved PaintStop document. Save: save a document with the same name. Documents previ¬ously opened will be saved with the same name. Save As: save a document with a new name. Export Tab: export a tab as a ZBrush document, for loading into ZBrush sepa­rately from PaintStop. Exit PaintStop: exit and return to ZBrush. Note that all the tabs will be cleared when you exit ZBrush, so remember to save a PaintStop document. 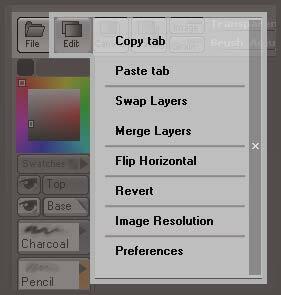 Copy Tab: copy a tab so that it can be pasted. Paste Tab: paste copied tab into the selected tab. Swap Layers: swap the Base and Top layers around. Merge Layers: merge the layers to the selected layer. Flip Horizontal: flip both layers (and tracing image, if there is one,) horizontally. Revert: return to previous saved version of tab. Useful as an undo for operations like ‘Merge Layers’. There is the option to accept or reject the change. Image Resolution: change the resolution of the document. This is for display purposes inside PaintStop – press the Print button on the right of the interface to show the printed size. Pixel dimensions are not changed. This option can be useful for check­ing image size. Preferences: change the PaintStop preferences. Select a new canvas grain for the document. This will change the grain for the selected tab only. For all tabs to have the same grain a new document must be created. Select a grain from the thumbnails or press Load Custom to choose an image or alpha. Any image can be used. 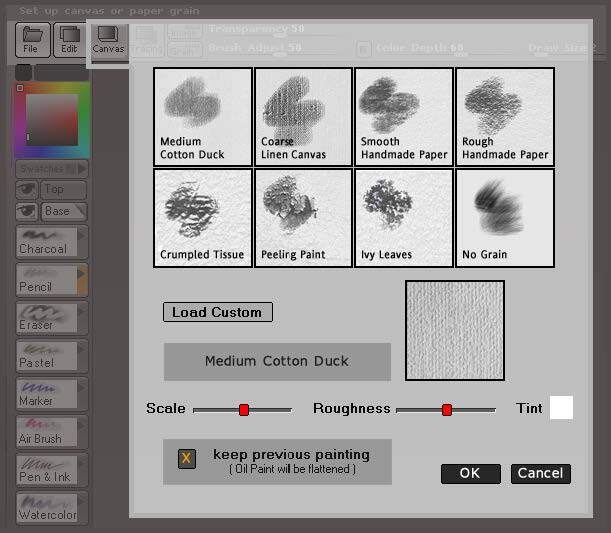 Change Scale and Roughness of the grain by clicking positions on the sliders. This will affect the size of the grain and the depth of the grain. Keep previous painting: make sure this option is checked if you don’t want to clear your work. Oil painting will be flattened. Tint: will change the canvas background tint. This can only be changed if ‘keep previ­ous painting’ is NOT checked. Note that tint color will reduce the amount of layer trans­parency that is possible. To toggle the canvas grain off and on, press the Grain button. Load Image: load a tracing image. A thumbnail of the selected image will be shown in this menu. Clear Image: clear the tracing image. Merge with Canvas: merge the tracing image with the current layer. 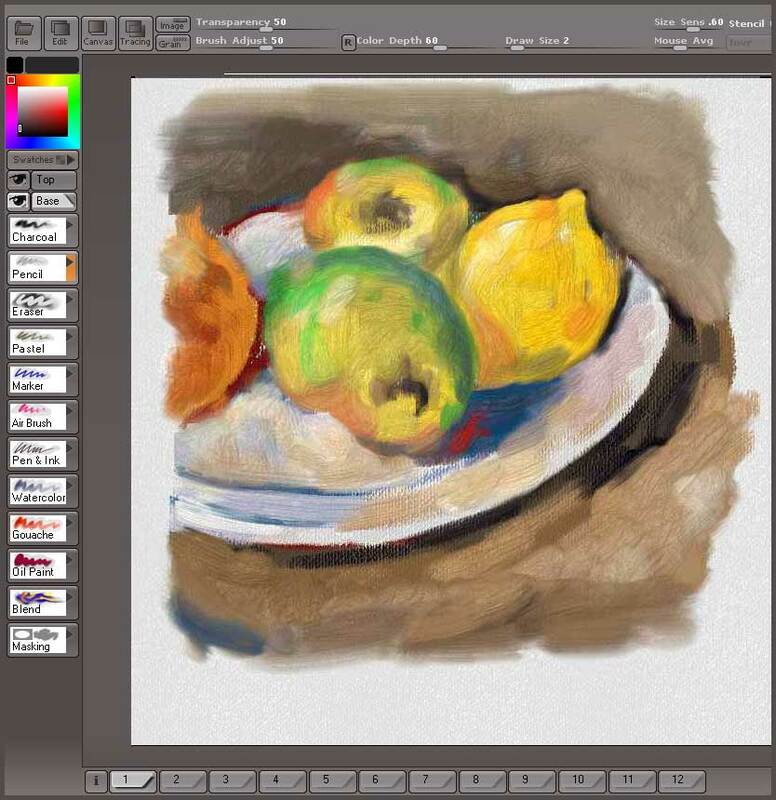 Create from Canvas: make a tracing image from the current painting. There is an option to clear the painting. Note: Use the Transparency slider at the top of the interface to control how much the tracing image shows. To toggle the tracing image on and off press the Image button. The Transparency slider at the top of the interface controls the layer transparency. Select a layer by pressing its button. The eye icon to the left toggles its visibility. Note that if a tracing image is loaded then transparency does not work satisfactorily when both layers are visible. To clear a layer press CTRL+’N’. To fill a layer with the selected color press CTRL+’F’. On the right of the interface are the display buttons. Scroll – pans the canvas. Zoom – zooms the canvas. Also pressing hotkeys ‘+’ or ‘-’ will zoom in or out. 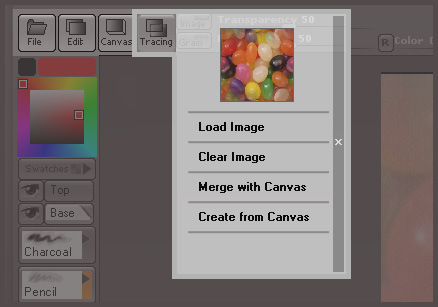 Actual (or hotkey ‘0’) – displays the canvas at actual size. AAHalf – displays the canvas at half size with anti-aliasing. This will produce ideal results for images on the web. Print – displays the canvas at the size it would be printed, according to any dpi that has been set. Alt Doc – toggles the alternative document view. This is useful if your are working close up on a large image and want to see a zoomed-out view at the same time. Set the option in PaintStop Preferences to display the whole of the image if this is possible (larger images will be scaled as small as the zoom allows). Pressing the button will also rescale the image if you have dragged the handle to increase/reduce the AltDoc view size. Turn off the option to set the zoom by hand. Click CTRL to reposition the view to the area being worked on.